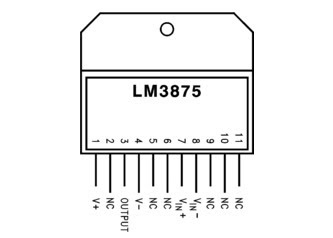 The LM3875 is an audio amplifier for high power output capable of delivering 56W of continuous average power to a load 8. The performance of the LM3875, utilizing its maximum instantaneous auto temperature (° Ke) (Spike ™) protection circuitry, places it in a class above discrete and hybrid amplifiers by providing a yes, dynamically protected area of safe operation (SOA). SPIKE protection means that these parts are fully protected against output overvoltage, voltage surges caused by shorts to the supplies, the peak temperature thermal runaway, and instantaneous. 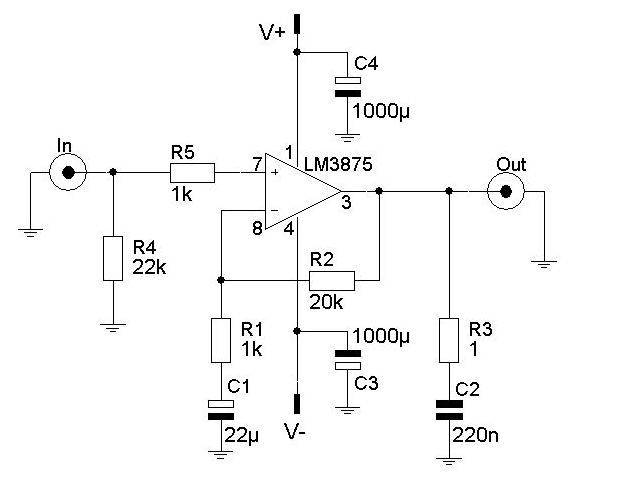 This amplifier circuit is based on the non-inverted GainClone standard configuration. I did some calucaltions the feedback resistor and other components in order to check the gain, etc. For more background on the calculations relevant to GainClones in the background section. Offset Voltage max, 25C 10 mV. Supply Current Per Channel 30 mA. PowerWise Rating 2 3750 uA/MHz. Input OutputType Not Rail to Rail. 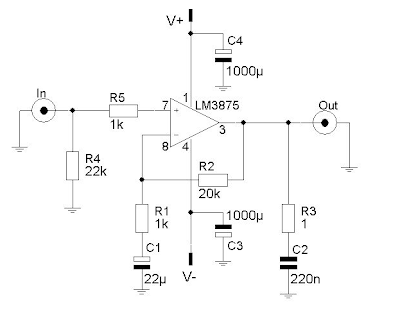 Max Input Bias Current 1000 nA. Temperature Min 0 deg C.
Temperature Max 70 deg C.